In a recently published New York Times profile, conductor Esa-Pekka Salonen points to many issues plaguing American symphony orchestras – the stale pageantry of the symphony-going experience, blindly upholding tradition, and failing to cultivate younger audiences – but one of the most troubling issues is the lack of infrastructure supporting young composers. 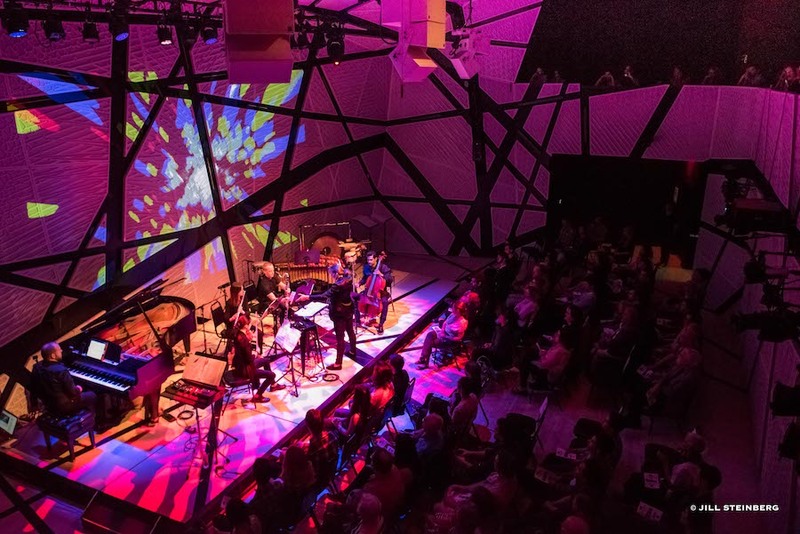 While many of the large, hallowed institutions are noticeably struggling (or overtly neglecting) to provide a platform for emerging composers, smaller organizations such as National Sawdust are thriving. Why? Because organizations like National Sawdust are built on discovery programming. 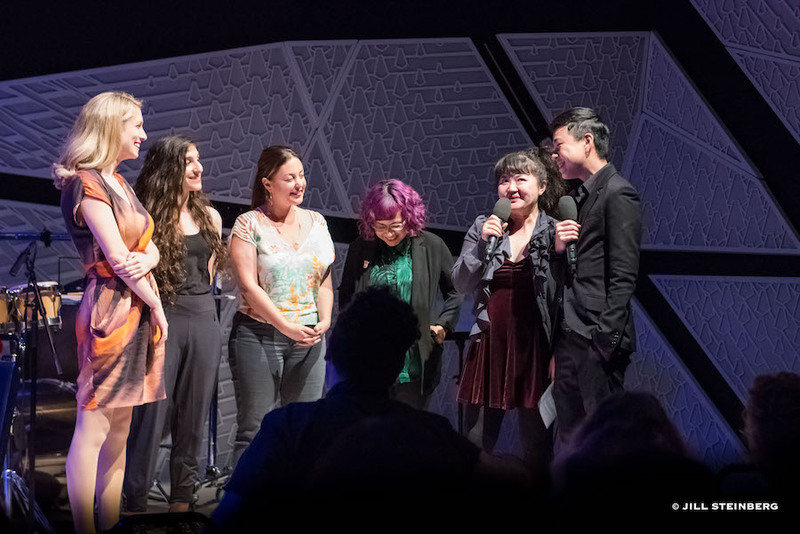 On June 12, National Sawdust hosted the culminating event of its inaugural Hildegard Competition, which seeks to encourage inclusivity in the arts through the mentorship of women and non-binary composers in the early stages of their careers. Performed by the Refugee Orchestra Project with conductor Lidiya Yankovskaya, the concert featured existing works by the five runners-up (Camila Agusto, Alexis Bacon, Amy Brandon, Diana Soh, and Akshaya Avril Tucker) alongside National Sawdust-commissioned world premieres by the three finalists: Kayla Cashetta, X. Lee, and Emma O’Halloran. The combination of discovery and mentorship create important points of entry for early career composers—but particularly those who have been historically marginalized and continue to face blatant discrimination. Hildegard finalist X. Lee, a transmasculine composer, shared that before transitioning, they were told that “women don’t have the brains to compose.” These strongly-held biases place an incredible burden on women composers, non-binary composers, and composers of color to produce nothing but high-quality work, lest they be eternally judged on the quality of one early career piece. For these composers from underrepresented communities, there is inherently less room for discovery, as one failed experiment could continue to fuel hundreds of years of discrimination. 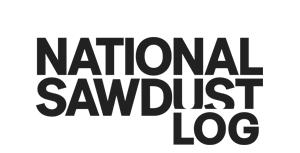 The Hildegard Competition was thus conceived as a way not only to amplify underrepresented voices, but also to provide a safe creative space for emerging composers, including a commission, coaching, a live performance, a recording, a cash prize, and a designated mentor for the duration of the project (Paola Prestini, Du Yun, and Angélica Negrón). In an explosion of lights, video projection, and blended acoustic and electronic sounds, X. Lee’s Casual Champagne and Cocaine emphatically kicked off the program. The work attempts to capture Lee’s experience living in Los Angeles, which they summarized as an “intense, in your face energy” that is often coupled with an attitude of indifference. Lee successfully creates this aesthetic through a score that oscillates between wild sensory overload – pounding bass drones, morse code-like pinging, gritty string tremolos, and jangling prepared piano – and stasis—delicate woodwind sustains, sparse high-register piano, and the unpitched rushing of air through instruments. Alexis Bacon’s Excellent Sheep, inspired in part by Frederic Rzewski’s Les Moutons de Panurge, explores the simple relationship between unison and fragmentation. While the work suffers a bit from underdeveloped transitions, moments of brilliance stand out in the isolated blocks of ideas. 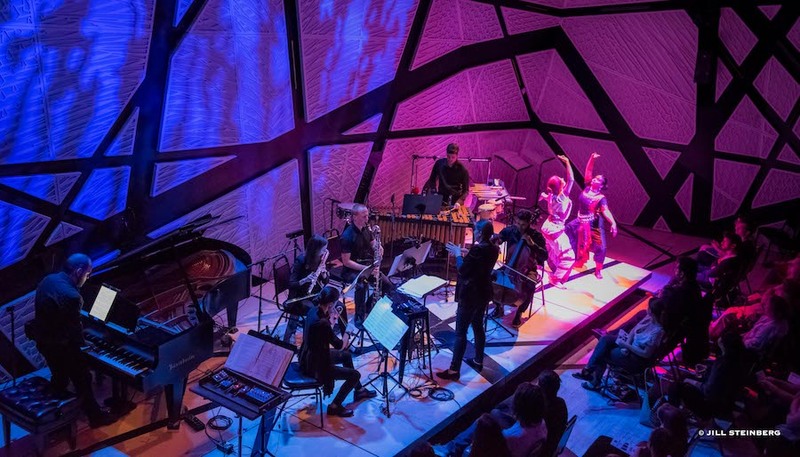 Particularly effective is the timbral kaleidoscope that emerges from a chugging rhythmic unison as different voices of the ensemble momentarily come to the fore. Camila Agusto’s Todavía captures a sense of whimsical nostalgia, calling on the playful simplicity of childhood memories that exist on the periphery of clarity. Agusto effectively creates this soundscape through gossamer textures of bowed marimba, subtle rhythmic pattering of clarinet key clicks and tapping on the body of the violin, glissando trills and tremolos, flutter tonguing, and just barely unintelligible whispering. Refugee Orchestra Project exhibited incredible control and sensitivity in this fragile ecosystem of sounds. The first half of the program concluded with Akshaya Avril Tucker’s Enough, to Unfold, which showcases a mature understanding of line and gesture that is clearly influenced by both vocal music and dance. Inspired by Hindustani singers, Enough, to Unfold features a duo of dancers choreographed by Tucker and Namita Devadas, whose precise hand gestures seemed to draw the melting glissandi out from the ensemble with each movement. Halfway through the work, Tucker exchanges strummed piano strings, marimba tremolo, and sighing pitch bends for triumphant chords and sweeping intervals that infuse breath into both the ensemble and the choreography. 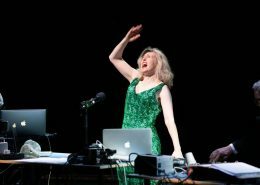 In hearing the lyrical flute and cello accompanied by undulating piano in Amy Brandon’s gestures of recoil, one could not help but recall another famous trio for the same instrumentation: George Crumb’s Vox Balaenae. Brandon’s piece employs many of the same techniques found in Crumb’s work – cello tremolos and “seagull” harmonics, singing while playing the flute and chanting percussive syllables, the characteristic clanging of a prepared piano – and the blue light that bathed the stage only encouraged this comparison. However, gestures of recoil effectively explores this familiar sound world, so even if the likeness to Vox Balaenae was unintentional, it could make for an excellent companion piece. Diana Soh’s Incantation: remixed explores the dichotomy between space and sustain, setting a sparse sea of pizzicato and staccato articulation against audible exhales, harmonics, and whistle tones. 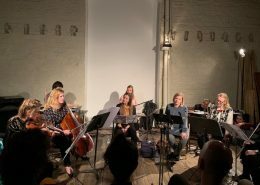 Here, the precision of Refugee Orchestra Project was once again on full display as they expertly manipulated the natural reverberation of their acoustic instruments. 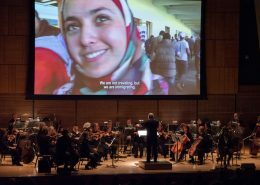 Kayla Cashetta joined Refugee Orchestra Project for the world premiere of her work Anima. Poised behind a series of effects pedals, Cashetta sculpted an analog drone in real time along with the ensemble. Explorations of register and instrumental timbre in Anima yield fascinating interactions between electronic and acoustic sound—sometimes fusing into a seamless electroacoustic partnership, such as glistening electronics paired with upper register acoustic sustains, and sometimes at odds, such as the driving, pulsating bass that devolves into chaos when paired with the ensemble. The evening concluded with Emma O’Halloran’s Constellations, one of the most unencumbered, authentic, and joyful works that I have heard in recent years. In an effort to create a work about “finding your voice and making the art you want to make,” O’Halloran samples the Spice Girls and remixes them into irresistibly catchy grooves, incorporates cool, pop-infused vocals with synthy sustains, and invokes fiddle tunes in the strings before delivering a delicious bass drop. In making something so honest, O’Halloran proved the effectiveness of simple motivic writing drawn from disparate influences and recombined in novel ways. At the intermission, the finalists and mentors had spoken about the process of creating their commissioned pieces. While Du Yun noted that the finalists and mentors on stage were “all failures in a lot of competitions,” Prestini emphasized that the Hildegard Competition was created in order to provide “a space to try things.” This freedom to explore, freedom to fail, freedom to revise, rework, and try again, is far more meaningful than many competitions and calls for scores that offer a one-time performance or commission. Instead, the most important element of the Hildegard Competition is the sustainability of the experience: relationships built, mentors gained, and the permission to discover and celebrate genuine expressions of self.